Warning: This is not investment advice. You are advised to conduct your own research and seek professional guidance before making any investment. Individual Retirement Accounts (IRAs) are the perfect investment vehicle for building a retirement nest egg. However, most IRA accounts concentrate the overwhelming majority of their assets in stocks and bonds. While these are great choices in equity and fixed income bull markets, they expose traders to considerable risk in market downturns. One of the best ways to remedy this risk is to have a portion of assets in an IRA that invests in physical gold. To qualify as a gold IRA, an account must meet certain standards. The metal held in the account has to meet Internal Revenue Service (IRS) purity standards, and the account must be held by an outside IRA trustee, not the individual. 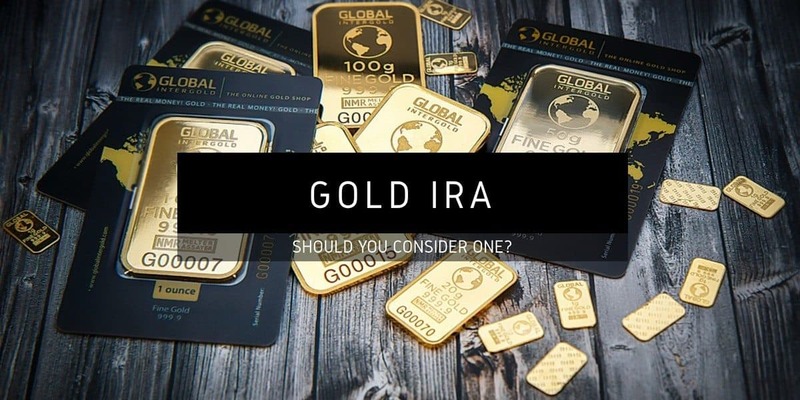 We examine five compelling reasons why every trader should have a gold IRA. Individual stocks have historically enjoyed high correlations with one another. In fact, the correlation between individual stocks almost always increases during severe market downturns. In other words, when the stock market makes big corrections, generally all classes of equities lose value. Having your assets in a basket of stocks does little to buffer a portfolio from losses. On the other hand, physical gold and stock prices have historically enjoyed a low and sometimes negative correlation with one another. During seven of the eight bear markets over the last 40 years when the S&P 500 lost more than 15%, physical gold outperformed the stock market, usually by a significant amount. In six of those equity bear markets, returns on physical gold were actually positive; in three of them, gold generated double-digit returns. Consumers buy home, auto and health insurance because they value the protection those policies offer in the event of a catastrophe. Yet most traders give little thought to insuring their equity portfolios from disaster. True diversification is the best insurance in the event of a stock market crash. History shows that investing in gold provides such diversification, whereas simply investing in stock indices does not. One of the best reasons for owning a gold IRA is to protect a portfolio’s purchasing power against the ravages of inflation. Gold offers an excellent way to insulate a portfolio from a serious flaw in fiat currencies (e.g., the US dollar, euro and yen). Central banks have unlimited powers to print money and devalue their currencies. The US and other large economies rely increasingly on exports and consumer spending to bolster GDP. By keeping rates very low and expanding the money supply, the Federal Reserve ensures that US exports can remain competitive globally and US consumers can continue to borrow and spend. This ability to print unlimited quantities of money has yet to pose a serious problem for the US dollar. Some observers have noted that the US dollar hasn’t lost so much purchasing power when you take into account interest and dividends from investing. However, a comparison of the relationship between real (not nominal) interest rates and gold shows a very strong positive correlation. This comparison suggests that gold prices do in fact rise when inflation is rising. Should the US experience severe inflation, stocks are unlikely to perform nearly as well as gold. In fact, hyper-inflation could create a large downturn in stocks, whereas gold will likely benefit. Investors who want to protect their purchasing power when they retire may benefit from investing in a gold IRA. It may seem counterintuitive, but gold is an excellent hedge against deflation as well as inflation. In the 21st century economy, there are strong reasons to fear deflation. Despite very accommodating monetary policy from the Fed and other central banks, wages and consumer prices show no signs of rising significantly. Globalization and technology may be keeping a lid on prices and rendering monetary policy less effective as a tool to combat economic slowdowns. In addition, the retirement of baby boomers and a low population replacement rate are reasons for concern. In the view of some market observers, these factors make deflation a bigger threat than inflation. History shows that gold performs very well during severe periods of deflation. During the Great Depression of the 1930s, the US experienced the most severe episode of deflation in the nation’s history. The dollar was backed by gold during this period. In response to economic conditions, President Franklin Roosevelt devalued the dollar by 70% and revalued gold by 70% from $20.67 to $35.00 an ounce. During the early years of the Great Depression, the Dow Jones lost 90% of its value from its peak to its bottom, and property prices tumbled by more than 50%. The strong showing by gold versus other asset classes during the Great Depression dispels a common myth. Economic theory suggests that commodity prices should fall during deflationary periods. Yet gold has never behaved like a normal commodity. In fact, gold may be seen as a safe haven when prices for all other goods are falling. Putting a portion of assets into a gold IRA might be a great way to protect a portfolio during extreme periods of deflation. Financial Systemic Risk: Corporations, banks and consumers have enormous levels of debt on their balance sheets. Changes in interest rates or market perceptions of the sustainability of this debt load could create real panic in markets. Furthermore, world economies are increasingly interdependent on one another, so a currency or debt crisis in one country or region is unlikely to remain localized. Unlike stocks, debt and other financial instruments, gold cannot lose all its value and is a viable way to hedge against financial calamities. Terrorism and War: Markets faces constant and tangible risks from terrorists and rogue nations that seek and have access to chemical, biological and nuclear weapons. While the chance is small that any individual act of terror will create systemic risk to the global economy, the economic fallout from a large-scale attack could be cataclysmic. Another debilitating scenario would be an attack that incapacitates electric grids, or communication or transportation infrastructure. Gold is likely to perform much better than financial assets if such nightmare scenarios unfold. Collapse of Fiat Money: A global collapse in fiat currencies may lead to a huge rise in gold prices. As implausible as this scenario may seem, there are nascent signs that confidence in fiat money is eroding. The rise of cryptocurrencies and their growing mainstream acceptance suggest that global citizens may be losing faith in central banks. In fact, it is possible that fiat money could slowly disappear without a specific inflationary or deflationary catalyst. Of course, governments will fight to prevent this from occurring, but they may be powerless to stop it. While some say cryptocurrencies such as bitcoin will end up as winners, thousands of years of history suggest gold will continue to endure as an alternative currency. There are many reasons to be optimistic about growing global demand for gold irrespective of its role as an alternative to fiat currencies. Gold is a precious metal that has enormous emotional, cultural and monetary value to societies worldwide. As emerging economies, particularly in Asia, continue to prosper, demand for gold will likely increase. Technology – Gold plays a very important role in electronics because of the metal’s favorable physical properties. Gold doesn’t tarnish and is an excellent conductor of electricity. Connectors, switches and relays on cell phones all use gold, as do computer chips and memory boards. As the global economy grows, demand for gold in those products will increase. A gold IRA may be a very sound way to capitalize on long-term bullish trends for gold demand in electronics. Jewelry – The jewelry business has used gold for centuries. Growing wealth in countries such as India, where gold plays a central role in weddings and other celebrations, will bolster long-term demand. While Asian economies have been price-sensitive about gold purchases, drops in the price of gold have consistently been met with strong demand. US traders with a long-term time horizon might benefit from strong secular growth trends in Asian countries. A gold IRA might be the ideal way to invest for the long term. Central banks – Ironically central banks, whose fiat currencies compete with gold as a store of value and a currency, are often large buyers of gold bullion. To maintain the credibility of their currencies, central banks are likely to continue to be net buyers of gold. The limited supply of gold above the ground and competing demand from industry and private citizens may hasten this demand. Owning gold in a gold IRA is a great way to capitalize on this long-term trend.